Scallops are a type of shell fish that can be enjoyed in so many different ways and variations. Sea scallops in particular, are a common type of scallop that can be served in a variety of ways. 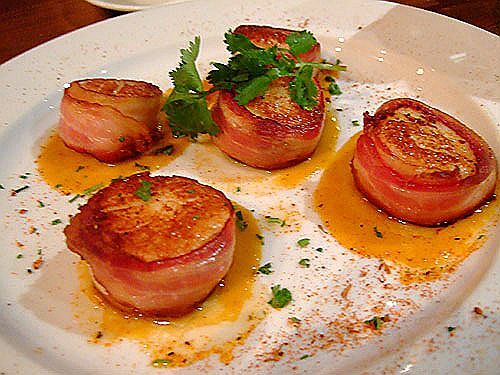 One of the most common and most favored ways of cooking and preparing sea scallops is to serve them as bacon wrapped sea scallops. Bacon wrapped sea scallops are a great way to start off any meal. Bacon wrapped sea scallops are great as either an appetizer or as an entree dish. There are many ways of making bacon wrapped scallops, and many of those recipes can be found in many different web sites with posted recipes on the Internet. One way of preparing bacon wrapped scallops is by preparing a pound of sea scallops, an equal amount of smoked bacon, fresh lemon juice, olive oil, pepper, and skewers or toothpicks. Start by mixing the olive oil, lemon juice and pepper in a bowl. Then, put in the scallops and allow to marinate in the refrigerator for at least one full hour. After waiting a minimum of one hour, wrap scallops individually in strips of bacon. You can keep them together with the help of a toothpick or by running about three to four pieces of bacon wrapped scallops through a skewer. Broil the bacon wrap scallops in a broiler pan until they are golden brown and the bacon is nice and crispy.